Chronic wasting disease has caused significant declines in east-central Wyoming white-tailed deer populations, according to new research published this week by University of Wyoming scientists. Chronic wasting disease (CWD) is a prion disease of deer, elk and moose found in 24 states and two Canadian provinces. The research, led by recent UW Ph.D. graduate David Edmunds, under the direction of Associate Professor Todd Cornish in the Department of Veterinary Sciences, is the first conclusive evidence that CWD found at high prevalence leads directly to population declines in free-ranging deer populations. The findings, published in the scientific journal PLOS ONE this week, provide new information that could influence management of this continually expanding disease. For eight years, he and his colleagues tracked white-tailed deer east of Casper to determine if CWD itself can cause population numbers to decline by increasing mortality of deer annually. “We found that CWD drastically reduced annual survival rates in the deer population, especially in females,” Edmunds says. 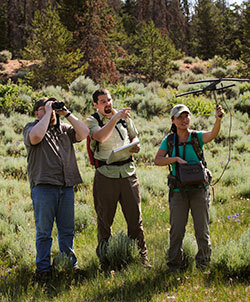 Working as a graduate student under Cornish in the Wyoming Wildlife/Livestock Health Center in the Department of Veterinary Sciences, Edmunds and colleagues captured both female and male fawns on their winter ranges to test whether they had CWD; pregnancy tested females; and marked all deer with radio transmitters attached to collars for tracking purposes. 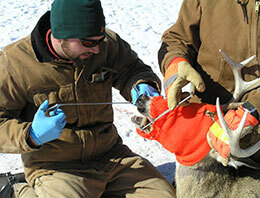 Deer were tracked throughout the year and captured annually to retest for CWD. A variety of data were collected, including survival and pregnancy rates, number of fawns seen alongside does in late summer, and CWD prevalence. All of these were used to determine the population growth rate -- which is by how much the population size varies from one year to the next. The researchers found that over the study period from 2003-10, the population declined 10 percent annually, which they say could lead to localized extinctions in less than 50 years. Cornish says the findings highlight the importance of preventing CWD from spreading into new deer and elk populations. Edmunds and Cornish are two of the co-authors of the report published Tuesday -- along with a collaborative team of researchers from the Wyoming Cooperative Fish and Wildlife Research Unit, the Wyoming Game and Fish Department, UW’s College of Agriculture and Natural Resources, and Texas A&M University. To read the article summarizing the research in PLOS ONE, go to bit.ly/cwddeer.